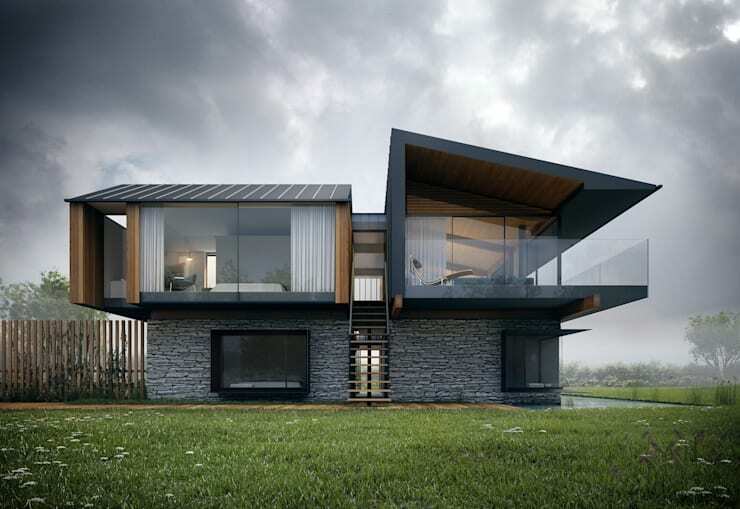 Today, homify 360° transports you not only to Wales in the UK, but also seemingly to the future. 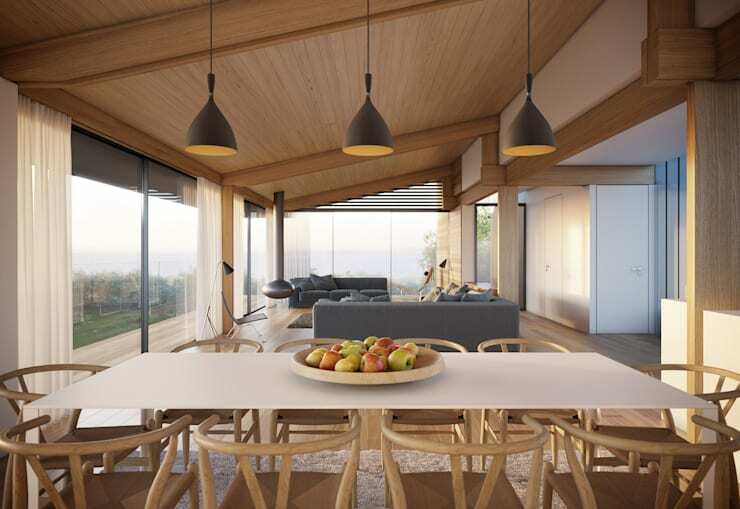 A stone and wooden structure, masquerading as a contemporary vacation home in West Cliff, Southgate, has been brought into existence by Hyde + Hyde Architects. 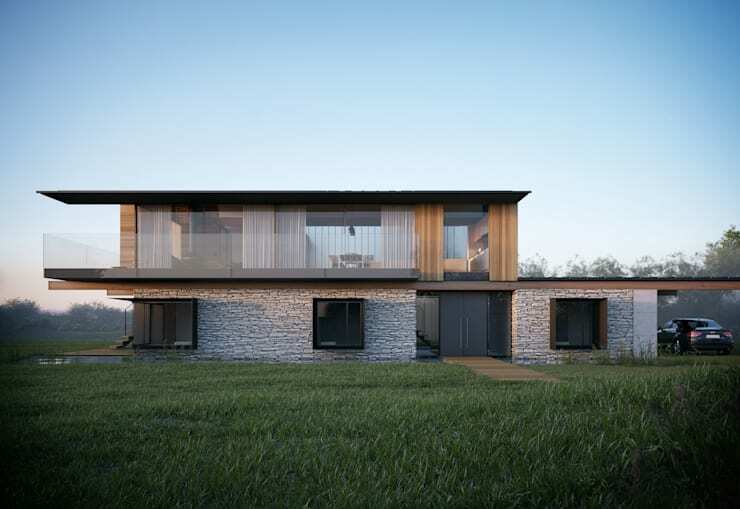 However, the images we’ll be using to discover the house is presented to us by Metro Cúbico Digital, a firm specialising in high-quality visualisation images when it comes to bringing architectural projects (among others) to life. If this is what the future holds in store in terms of living space, then we have reason to rejoice – this villa is pure excellence. Forget the images of gadgets, robots and lasers that the term “futuristic” conjures up, because this house is presented in a stylish and chic manner that is sure to please any lover of the contemporary/modern style. Like a mechanical beauty clad in contemporary fashion, the villa towers over its surroundings. Laying its foundation on a flat, lawn garden enhances its bulk considerably. But it is not only its size that is eye-catching – its structure is just one of its many note-worthy elements. What started out as a simple rectangular area (very traditional in the contemporary field) seemingly transforms into an ultramodern space once it reaches the top storey. Wood and stone come together, and invite a substantial amount of glass to join its design, forming a structure that could easily pass for a hi-tech urban building. But this is no city office; it is an ultra fabulous living space! The stylish and chic exclamation from outside is transformed into a soft, familiar whisper as we enter the interior. The coated wooden floors echo a soft walk on the beach, with a plush brown carpet added for additional reasons to enjoy this house barefoot. 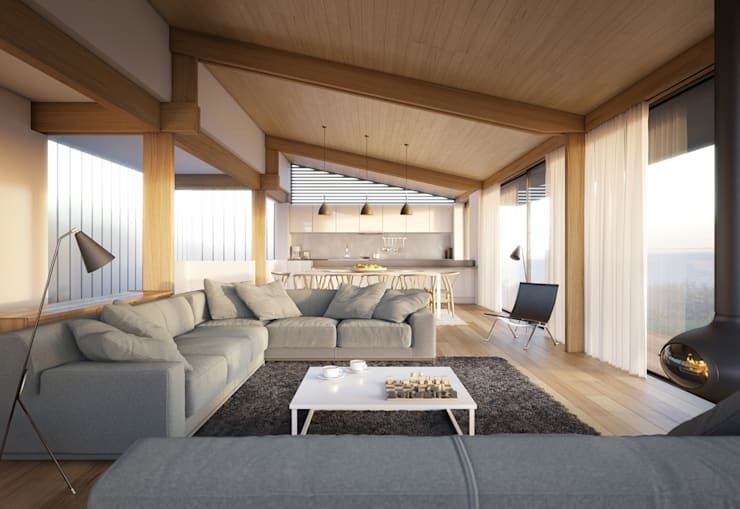 The designers have opted for an open plan with a versatile layout – the living room, dining space and kitchen area are integrated together, allowing for a smooth flow from one to the next. The space and natural lighting is put to full effect by the giant glass glazing, as well as the slightly pitched ceiling – quite the modern touch. Natural light follows us all around, but can easily be diminished with the mere flick of a window blind, allowing for a cosy and intimate time on the L-shaped dream space presented in the form of a pebble-grey couch. 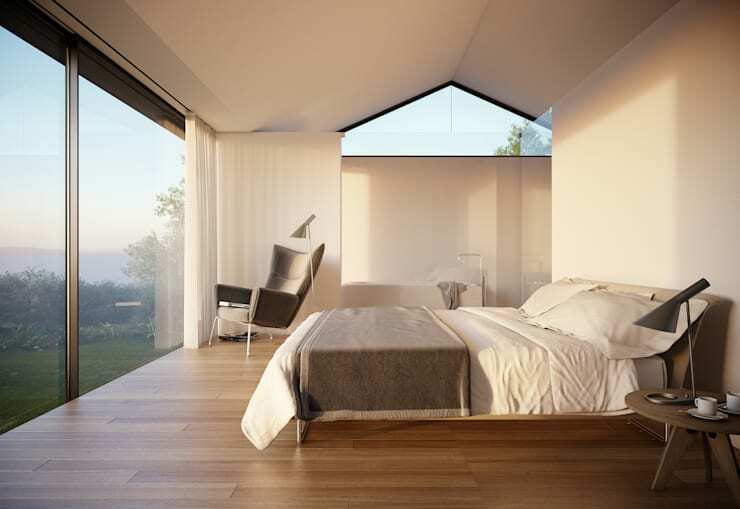 The glass windows allow for the stylish interior to extend to the serene outdoors – or is it the other way around? 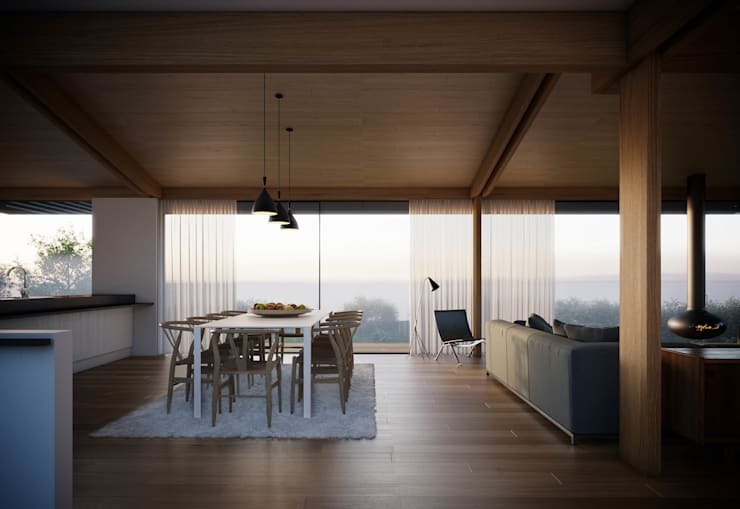 The seamless flow between the communal areas, linked together by that fabulous wooden floor, is well suited to entertaining. Plenty of space to be enjoyed, yet the house has a serene feel, almost a modern spa-like vibe, designed to rejuvenate and relax anybody who enters. The tips of the lush white carpet announce the ends of the dining zone – and what a stylish dining zone it turns out to be! Modern seating and a contemporary dining table are guarded by chic ceiling lights, extending a warm greeting from above. And for those occasions where one needs a glimpse of the outside, the panoramic view reveals a magnificent horizon noticeable from just about any corner of the modish interior. Less is more, as the wise ones say – and in this villa, it seems to be spot on. All the chosen decor and furniture create a good composition, making the interior feel both spacious and snug. A subtle palette of soft tones abound, creating a tranquil effect in this spacious sanctuary. The all-natural hues are soft on the eye, and are perfect in this timeless design that comes off as classic, yet modern. There are no overly dramatic colour schemes or complex patterns competing for attention – it’s a smooth, natural flow from floor to ceiling. And let’s not forget about that final ultra touch that really helps to up the comfort level here: that suspended, fascinating fireplace! For more inspiration when it comes to heating up your interiors, take a look at: 8 Unique Fireplace Designs. As we cross over to the bedroom side, things tone down and become calmer, while still maintaining a very modern touch. Here, its simplistic and soft, and small details emerge to make the most impressions (such as the small, triangle-shaped window on the side wall). Natural light continues to flourish here, allowing for optimum illumination in this magnificent spacing (not to mention a splendid view to guard over any heavy sleepers). Minimum décor and very little furnishing (still keeping up with the comfort and elegance factors) allow for a prime resting zone, making this bedroom the ideal intimate spot in the entire villa. The soft, natural hues are the perfect choices for the bedroom – even more so for when that redecorating urge takes place, which will allow for a perfectly clean canvas that’ll welcome any colourful contributions. One last look, this time at the back of the exterior setting. Where the facade was a compound greeting, the back of the house is more of a gentle wave goodbye. Yet, we are still left with a decent amount of contemporary style to satisfy our cravings – a glass-railed terrace, a chic combination of wood and stone, a minimal yet agreeable vibe. The upper floor, which we’ve had the pleasure of encountering, is one great glass glazing, perfect for those who need their light and their space. The downstairs floor houses the private areas with more solitude – which we’ll, hopefully, get to discover sooner rather than later. All of this, set on a spacious and gorgeous lawn, concludes our visit to this contemporary dwelling from the future – which turned out to be a calm, comfortable setting for the family seeking a stylish, yet intimate space.